A new model of the world-renowned LCR-meter Smart Tweezers from Siborg Systems Inc was released giving an exciting answer to the old problem of testing and trouble-shooting Surface Mount Devices. Surface-mount technology (SMT) is a dominating method for constructing electronic equipment in which the components are mounted directly onto the surface of printed circuit boards (PCBs). Such components are usually referred to as Surface Mount Devices (SMD). Currently the industry has largely replaced the older through-hole technology fitting components with wire leads into holes on a PCB. Often both technologies are used on the same PCB so that components not suited to surface mounting such as transformers and heat-sinked power semiconductor devices can be placed on the PCB. An SMT component is usually small and has either small leads or no leads at all. One of the big problems with SMT components is that it is usually too small to be labeled. Thus, you can easily lose track of parts and their values. This is where Smart Tweezers come-in handy. With the use of only one hand, this lightweight device quickly evaluates all passive types of SMT components, such as Resistors, Capacitances and Inductances. The Smart Tweezers LCR-meter automatically determines the type of component, resistor, capacitor, or inductor, and selects the proper range and signal frequency for the highest accuracy measurement. Using a small graphics display, the Smart Tweezers LCR-meter clearly displays the component type, measurement results, and test conditions used to determine the results. "The main advantage of Smart Tweezers is virtually instantaneous and highly accurate evaluation of SMT components as small as 0.3 mm," says Michael Obrecht, R&D director at Siborg. "This accuracy level of about 0.2% is only available from expensive bench-type LCR-meters that require significant efforts in setting-up the measurements." 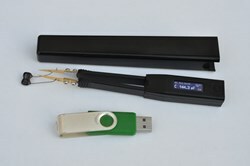 Smart Tweezers is an LCR-meter in a set of tweezers, with each of the tweezers two tines acting as a probe. The LCR-meter is designed for a production line component evaluation, on-board impedance testing, and SMD components sorting. With automatic recognition of measurement mode (L, C and R), the tool is especially suitable for identifying SMDs. Fully-automatic LCR-measurements, including automatic recognition of measurement modes (L, C, and R) and the range of measurement, allows the operator to focus exclusively on the component under test. As a result testing, sorting and evaluation of components becomes more efficient and cost-effective. The primary display shows the main impedance reading. The secondary display (on top) shows the present reading of additional parameters (such as parasitic resistance) and measurement. For example, ESR value can appear in the secondary display while capacitor value appears in the primary display. The Bar Graph provides an analog indication of the measured input. For most functions the primary display shows 5 digits. 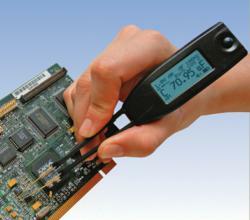 In addition, the Smart Tweezer allows to test continuity and diodes. Internal beeper sounds for resistance readings below threshold, or to indicate a momentary open circuit.